Like rotation transforms, you can set the origin for a skew transform using either the RenderTransformOrigin property on the element, or the CenterX/CenterY properties on the SkewTransform element. You can think of the center of a skew transform as the point that will be held in one place as the object is tilted. Also note–setting the X value of the center point only affects skews specified using AngleY and setting the Y value only affects skews specified using AngleX. In the example below, we use RenderTransformOrigin to move the Y component of the center point, which impacts how the AngleX skew is done. 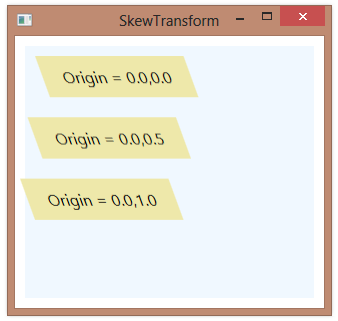 You can better see how this works by looking at how the Visual Studio designer shows you the skew. It also shows the pre-transformed element, so you can see which point is being used as the origin.